Carol and I are on the move to a new location. We’ve had all the drama, miscommunication, disrespect and incompetence we can stand. The time was right for a change plus we got a good offer on a winter gig. More about that later. 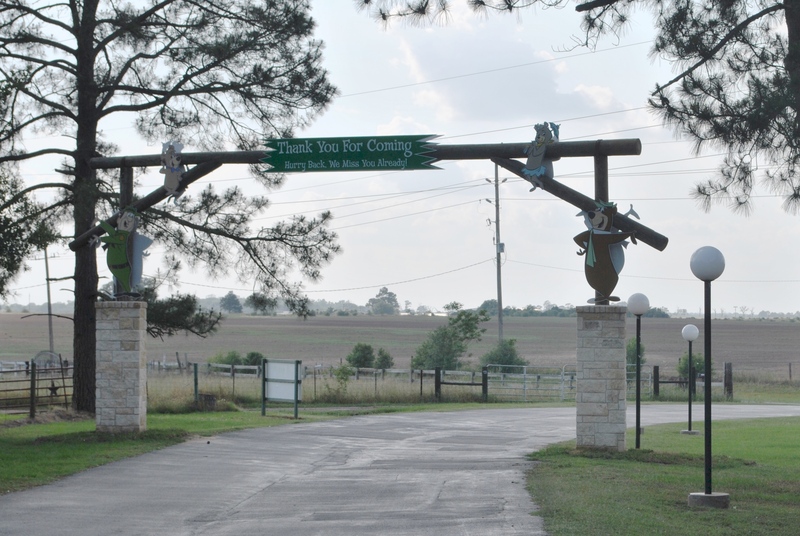 Lone Star Yogi is a large destination RV Park about 35 miles Northwest of Houston. They have a medium-sized water park that includes water slides, lazy river, toddler splash pool, and a couple of adult pools. 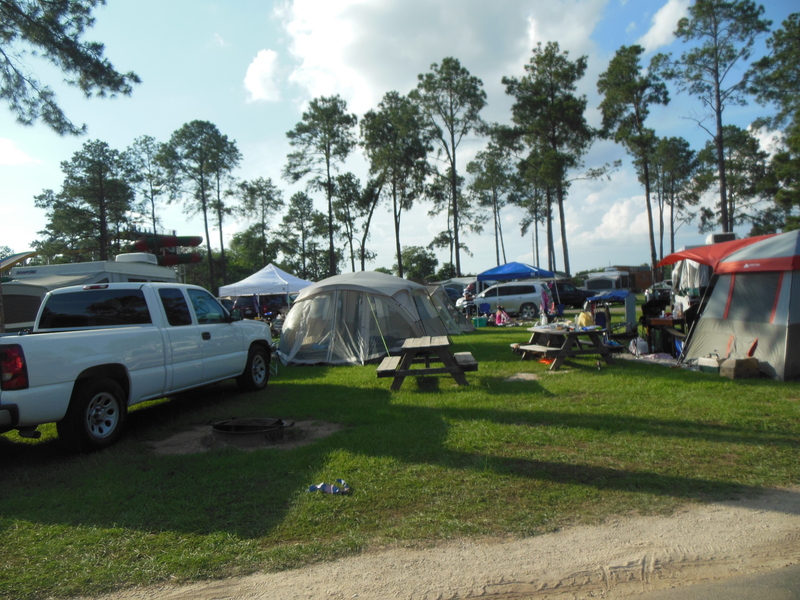 They have bout 150 RV sites, 150 cabins, 50 tent sites and a grand lodge that can accommodate 28 people. Between Memorial Day and Labor Day, the park stays pretty full. Most weekends are packed, especially the three-day weekends. On those busy weekends, the roads in the park are filled with people, bicycles, skate boards golf carts and the Yogi Express tram rides. Yogi Theater is adjacent to the activities building in the center of the park. The theater plays kid friendly movies every night. The activities building is a bustling center of crafts, games and other things suitable for kids of all ages. The multi-level playscape is between the theater and activities building. 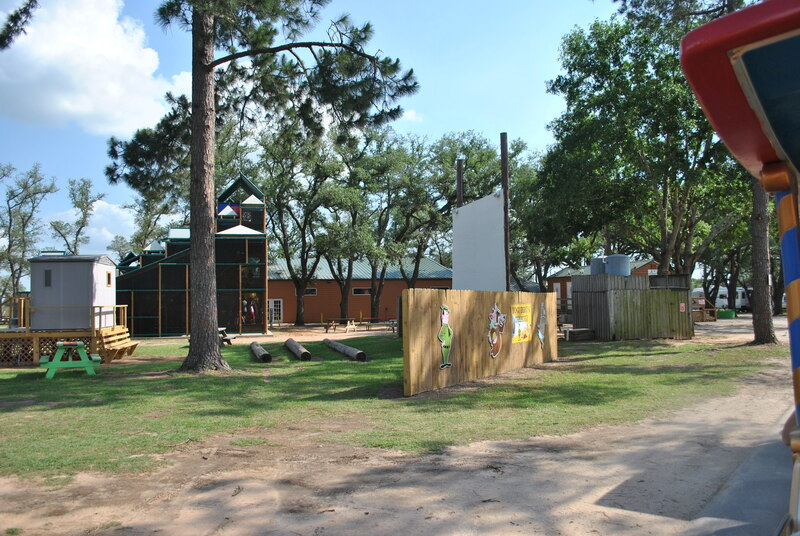 Yogi’s Karaoke stage, basket ball, volleyball and horse shoe pit are also around the activities building. 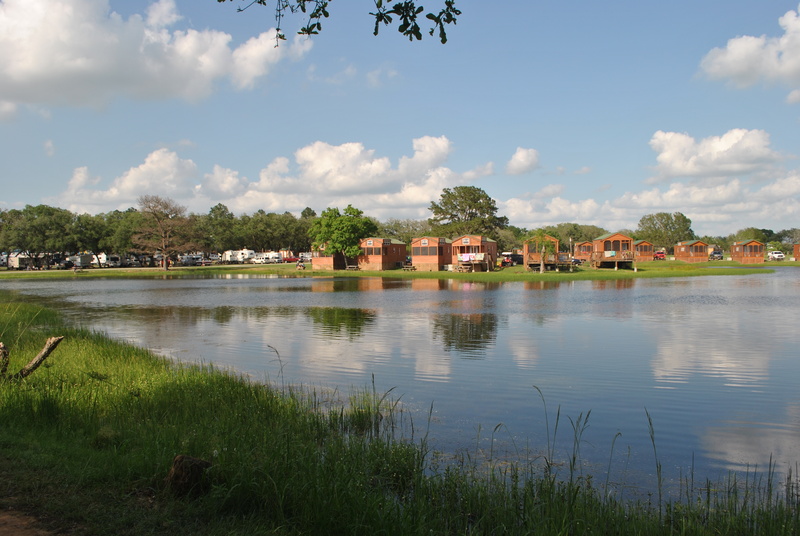 A fully stocked fishing lake is popular spot for campers of all ages. No swimming or boating is allowed in the lake. Tell that to the ducks. The walking path around the lake is full of campers searching for that hot fishing hole. Behind the flag pole is a free 18-hole miniature golf course. This spot is always full of people from 8AM until 10PM. 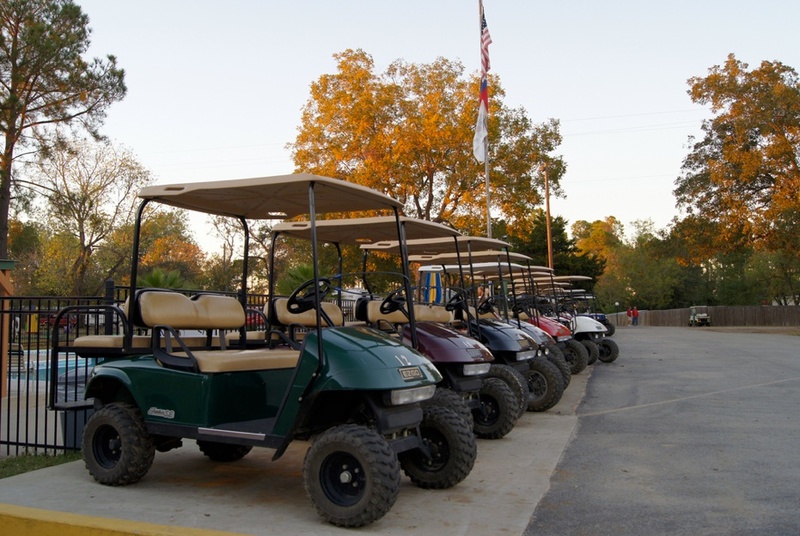 Because of the size of the park, campers love to rent golf carts. This makes it easy for them to move from campsite to pool to activities. It also adds to the congestion in the park. Cars, trucks and RVs must really have a watchful eye as they travel through the park. 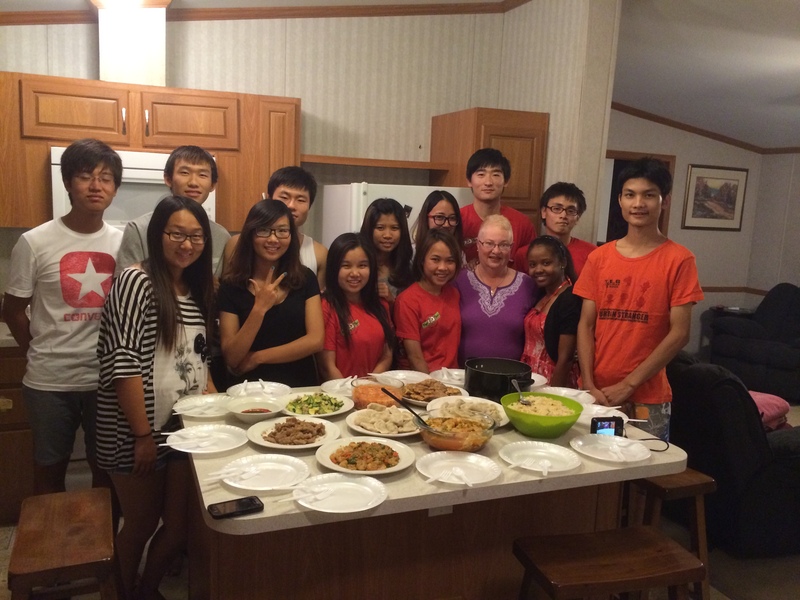 During the past 5 1/2 months, Carol worked in registration, supervised gate operations and hosted 16 international students from Thailand, China, and Dominican Republic. They called her their Texas Mom. I worked on construction projects and was available as backup maintenance when needed. The registration center had a 3 station call center plus front desk. The phones never stopped ringing. At the gate, Carol trained 5 college/high school students on gate operations which primarily included checking guests into the park and registering day use folks who came for the day to use the water park. On Thursday and Friday, the gate generally had about 300 guest check-ins. Sunday was a busy day-use day. Tuesday was shopping day for the students. Carol made sure they had a good experience in Texas. They visited Blue Bell Ice Creamery in Brenham, TX. Legacy RV Resorts corporate office provided tickets for the Houston Astros baseball at Minute Maid Park. And they enjoyed shopping at the mall. In the photo above, you see them gathered around their Texas Mom for a farewell dinner they prepared for us just before we left. Each person contributed something toward the dinner. All I can say is the food was yummy, tasty and authentic. My work was primarily construction. I worked with the corporate construction manager on several projects. 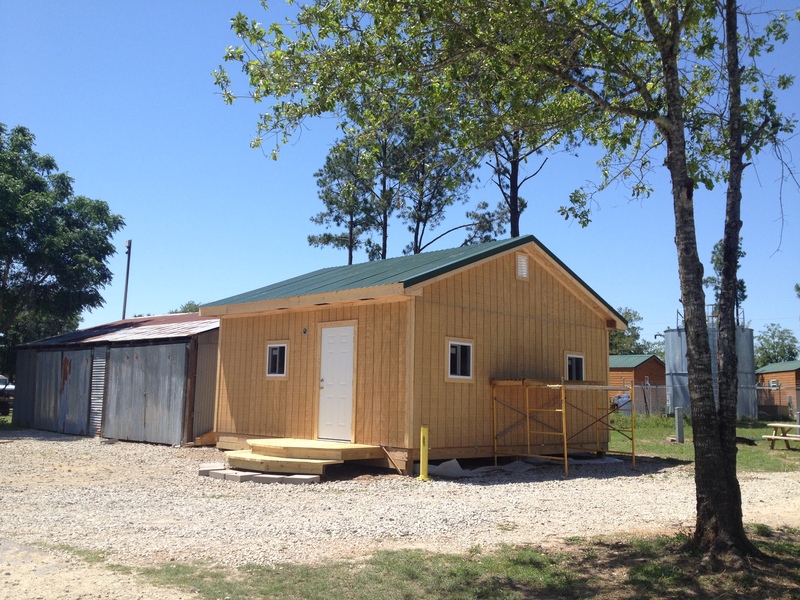 We built two 20×20 storage buildings for housekeeping, added a new enclosure on the well house near the activity center. We also completed several smaller projects around the park. 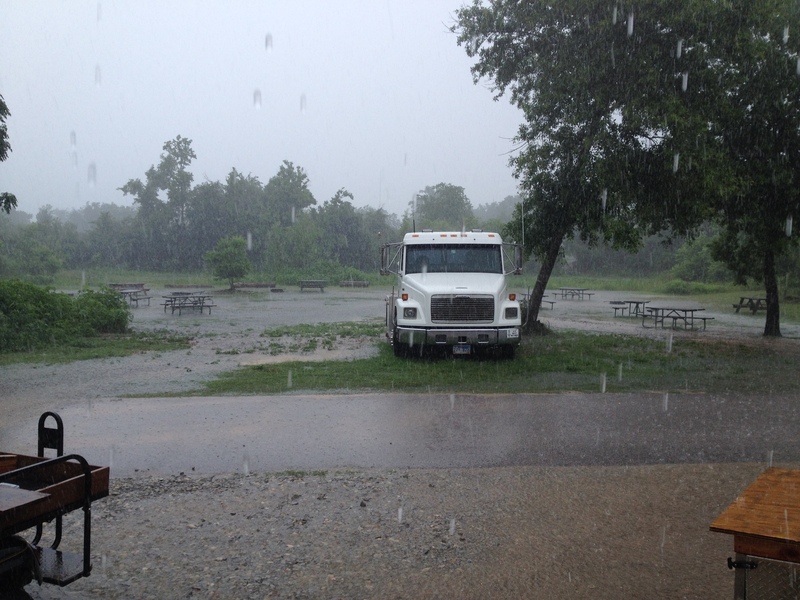 On a few occasions, I was called out to help out with park maintenance and pump propane. 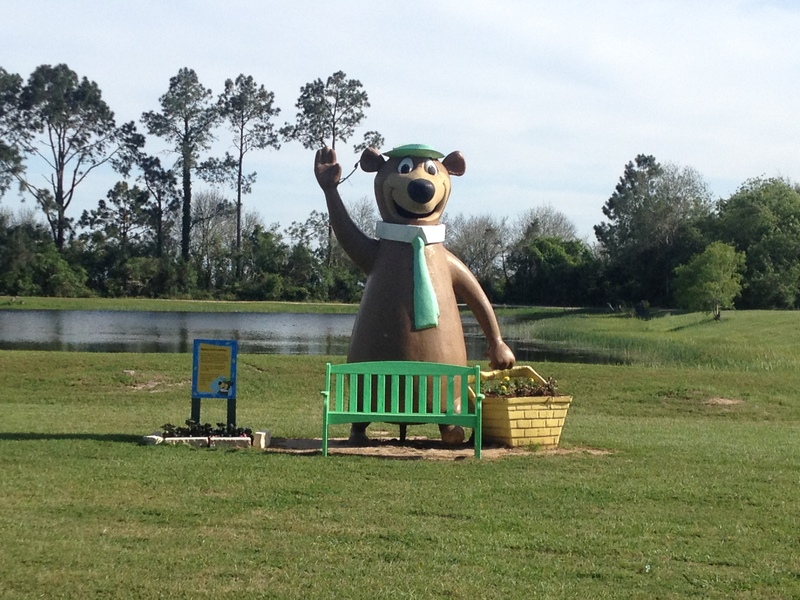 So as we drive off for a little R&R with family, we simply said good-bye to Yogi Bear. It was an interesting summer, not one we care to repeat in this park. Maybe somewhere else in Texas. That’s it for now, next we will tell you a little about our remodeling project and our winter workamping gig. Thanks for stopping by, y’all come back now. 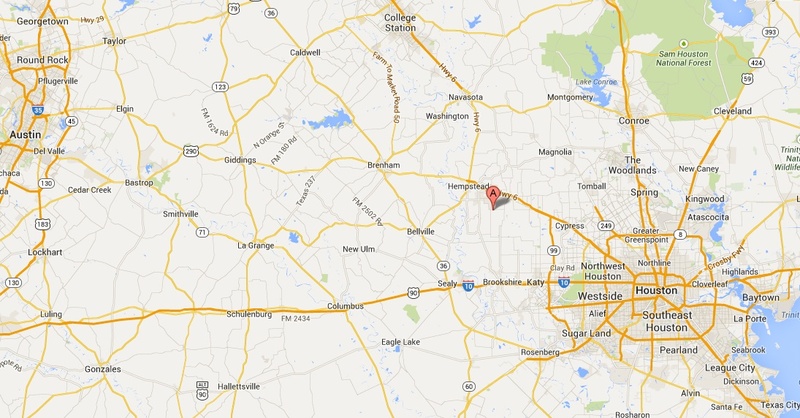 Waller, TX is a small community Northwest of Houston on Highway 290, about 30 minutes away from Brenham, Katy, and Tomball, Texas. 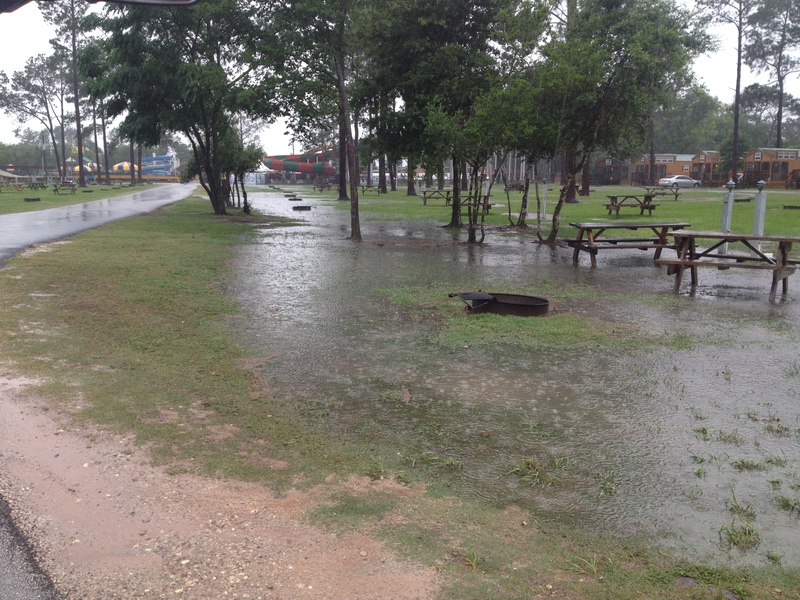 Our campground, Lone Star Yogi, is a quick get-a-way location for many folks in the Houston area. 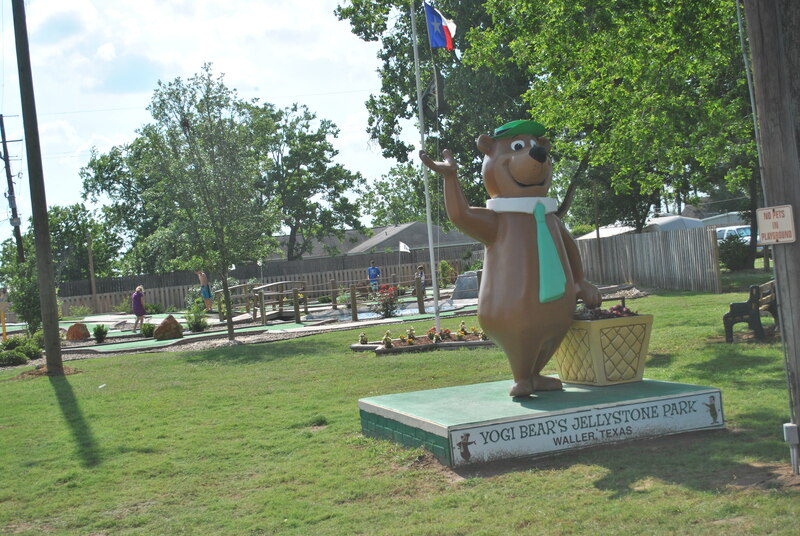 We arrived at Lone Star Yogi on March 1 after a short trip From Hidden Valley RV in Southwest San Antonio area. 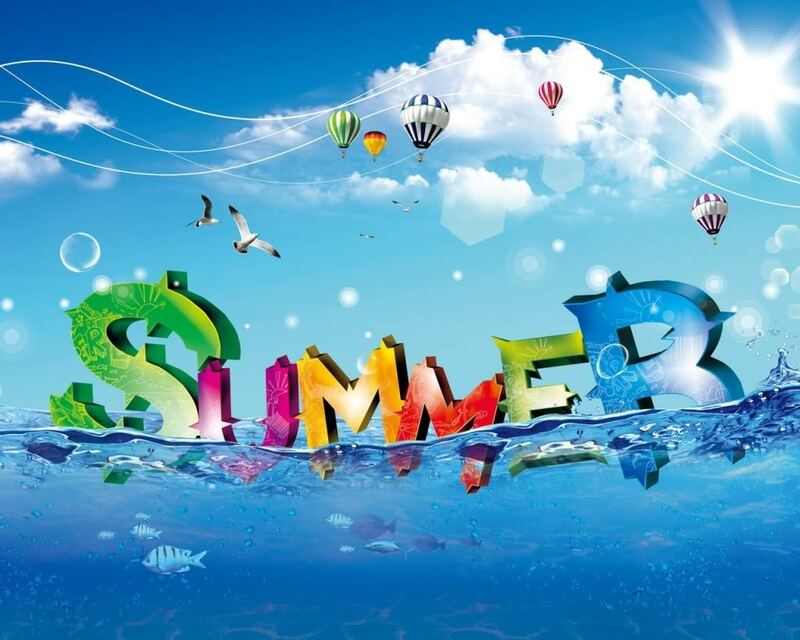 The first big event we encountered is Spring Break, which spanned three weekends and two weeks. The park is busy when it is full of people. 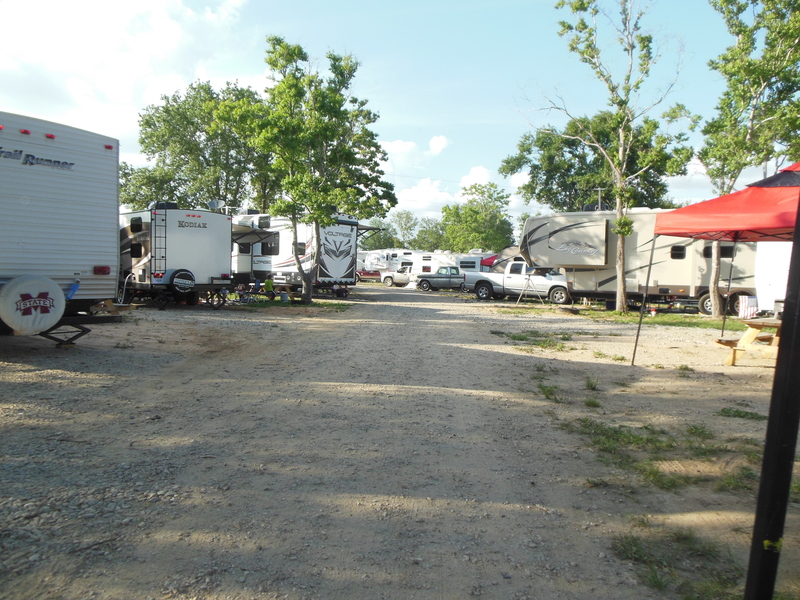 It does not take long for the 125 RV site, 40 tent sites and 150 cabins to fill up. 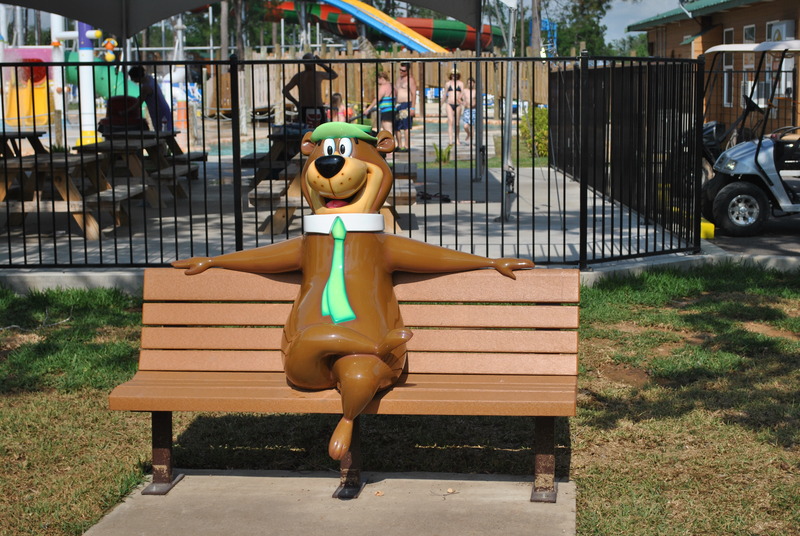 The park also has a small water park that is a major attraction for guests. 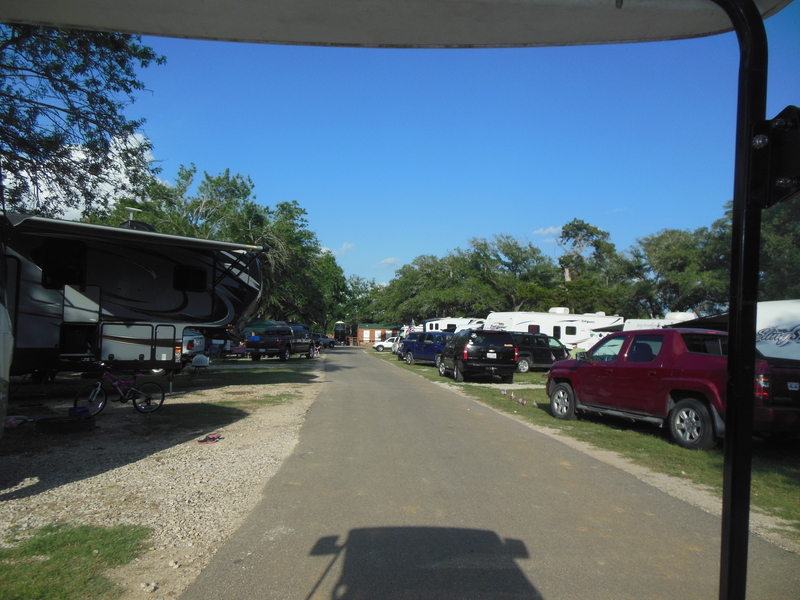 As is usual for many RV parks, Thursday and Friday are busy check-in dates while Sunday is the mass exodus. 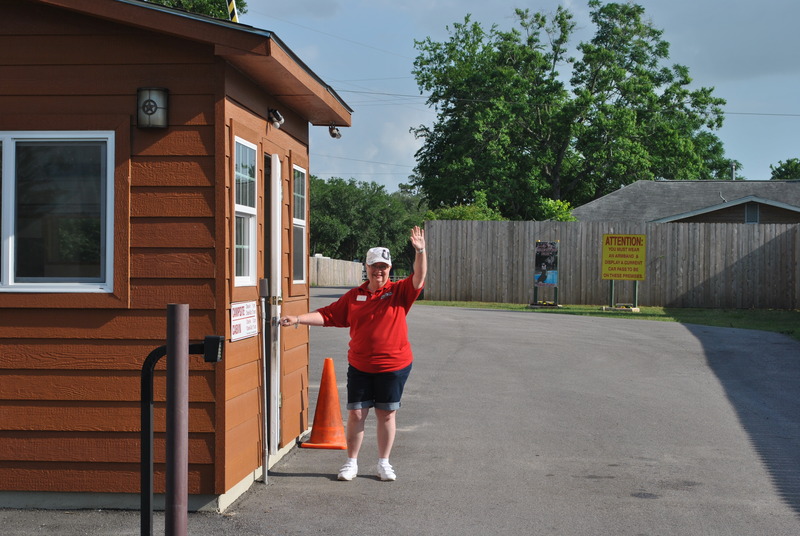 Carol works in the registration office during the week and is in the gate house on weekends checking in guests to the park. There are several ladies named Carol in the park so Carol has a new name. In this park, she is CJ. 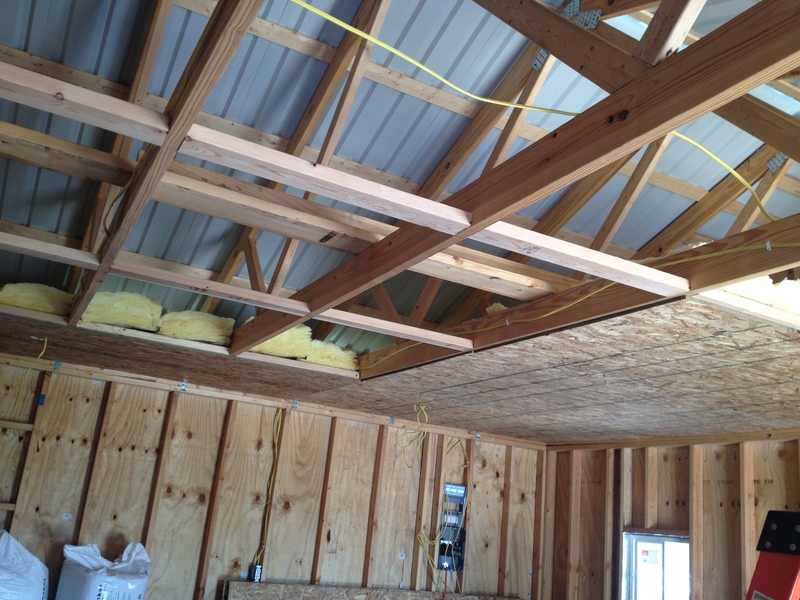 I work in maintenance, primarily focused on construction projects. I work with the Robbie who is the construction manager for Legacy RV Resorts. So what have I been working on? Well, it is a long list so here goes. 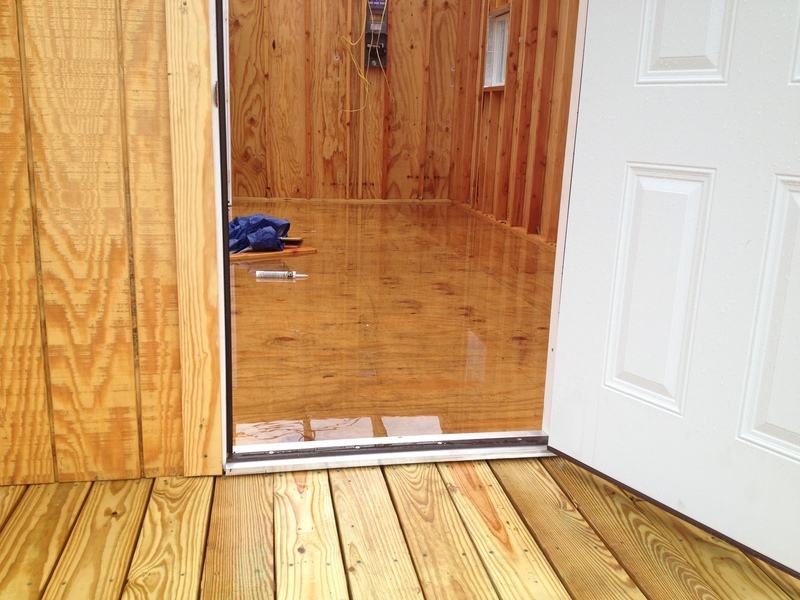 Project #1 – Repair a weak floor in bedroom of one cabin. The floor was weakened by a leaking shower mixture valve that had been replaced. 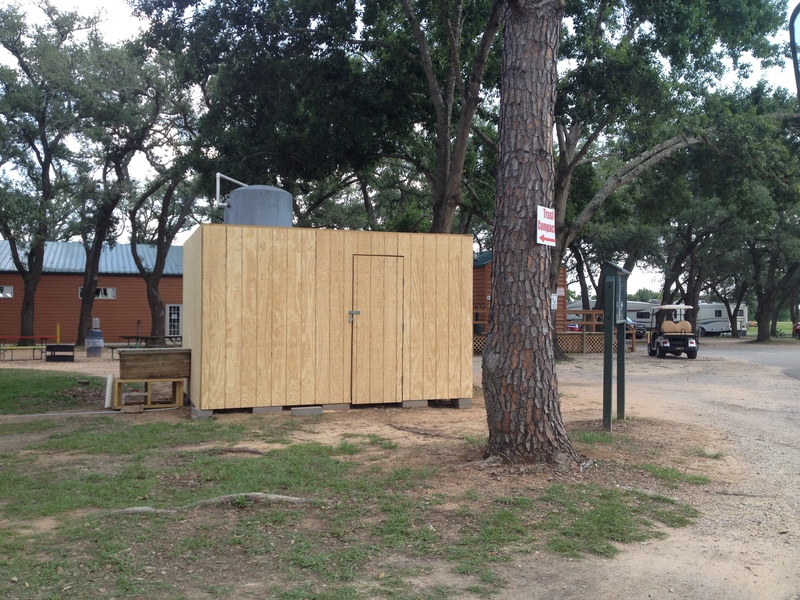 Project #2 – Mop Closet outside of the recreation center. Mops ‘out-of-sight’ makes for a cleaner look. Project #3 – Water Pump Enclosure. Water pumps adjacent to new tent camping area disturbed a camper. Enclosure is also insulated with 1 1/2 inch foam. After we completed this project, the tent camper thank us. Project #4 – A/C Repair. We replaced the outside A/C compressor as requested. 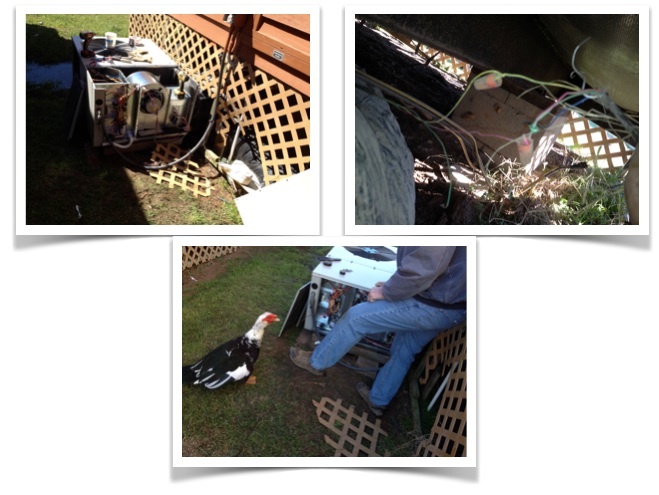 New unit would not operate so we then did a little trouble shooting and found bad splices on the control cable. Repaired the splice and all is well keeping that cabin cool. We also had to keep this duck at bay since he did not like us being around. Project #5 – Security Gate by General Store. The security gate keeps golf carts out of the solar panel farm which is located behind the general store. Project #6 – Septic Tank Fence. 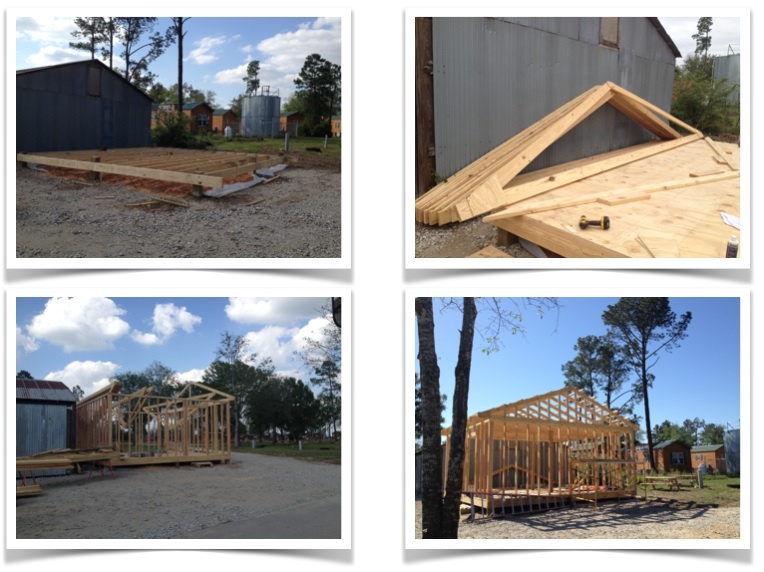 In two areas, we built a short fence surrounding two septic tank areas. 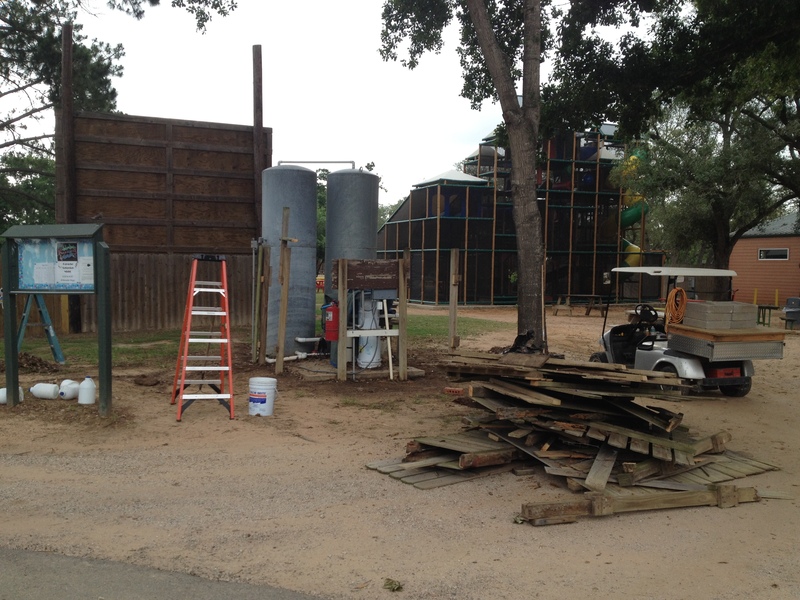 The fence will keep guests from driving golf carts near the tanks. Project #7 – Yogi Theater Projector Platform. The platform for the projection room was not stable. We built a new platform and included a bench seat for the mature guests. 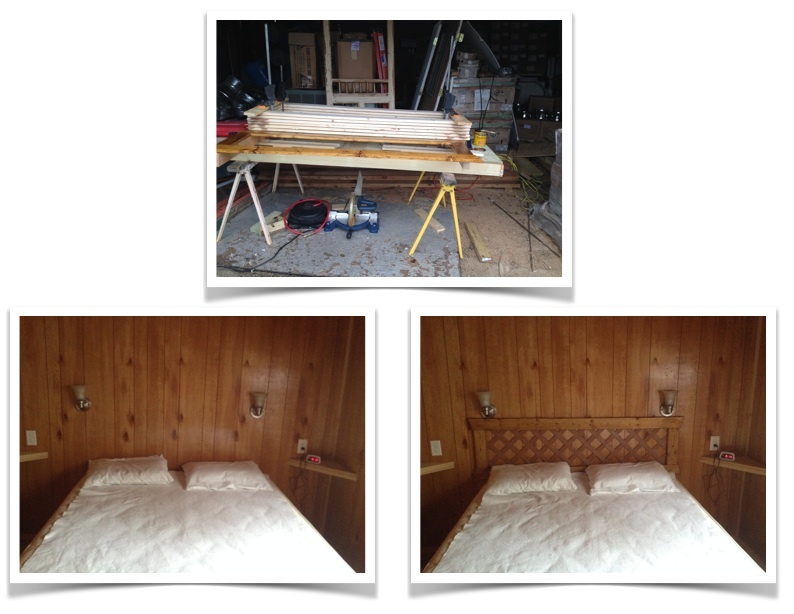 Project #8 – Headboards. I built 80 headboards to be installed in cabins. Sometimes it is the little things that have a big impact. 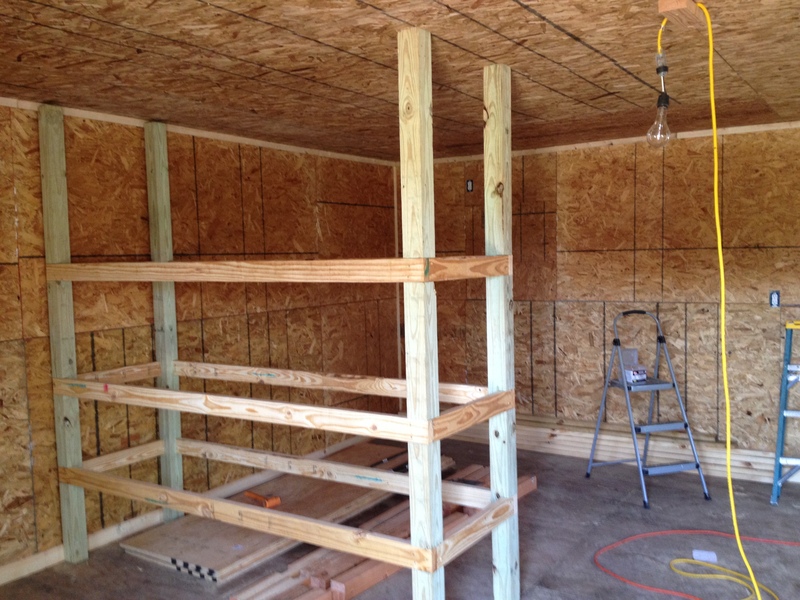 Project #9 – Housekeeping Storage Building. This is one of two buildings we are building for Housekeeping. 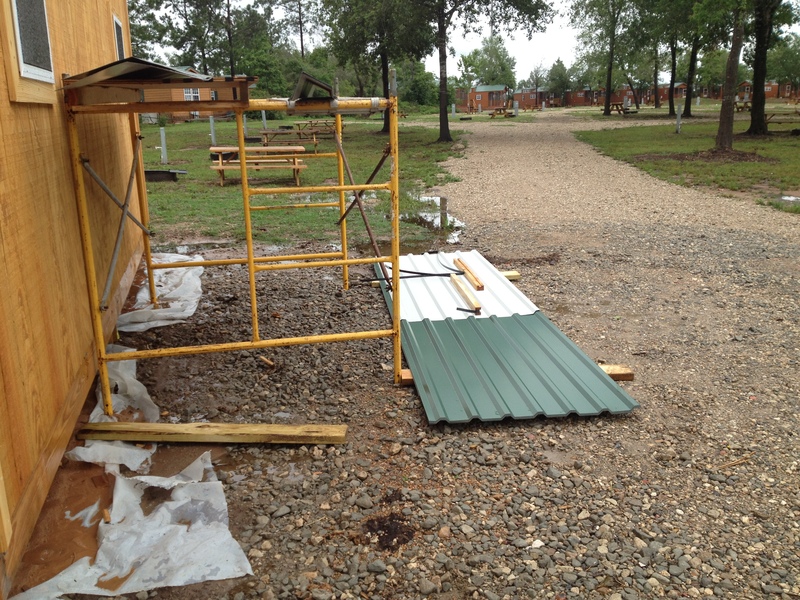 This will place cleaning supplies closer to the cabins. We should be done with one of the building by Friday. Then we can break ground on the other which has to be completed before Memorial Day Weekend. Project #10 – Signs. 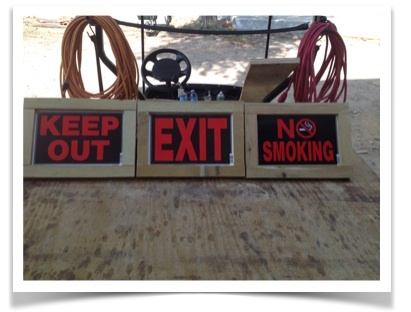 I made frames for several signs that were placed around the property. 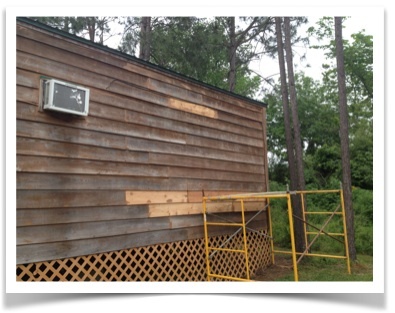 Project #11 – Repair siding on a cabin. We replaced 32 feet of siding on this cabin. The siding had to be custom cut and was expensive. Thirty-two feet cost $144. OUCH. On one of my trips back to the maintenance shop, I encountered a flat tire. 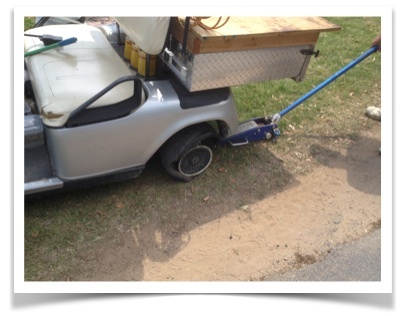 Fortunately Lone Star Yogi has an excellent staff of Golf Cart folks who came to my rescue. That is the end of project for the past two months. All these projects does not mean I work and have no time for play. There will always be playtime in our world. March is rodeo month in Houston. Our eldest daughter arranged for us to enjoy a day at the Houston Fat Stock Show and Rodeo. WOW has that event has really grown. 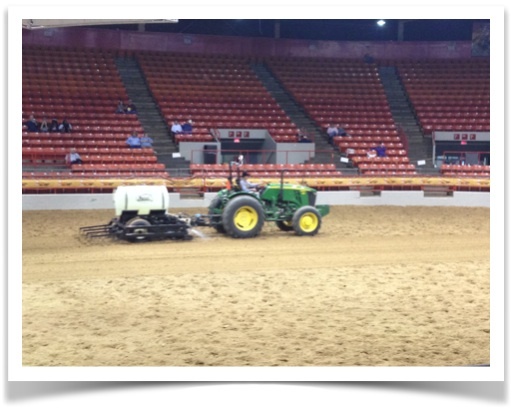 I bet you did not know they used a John Deere Zamboni to groom the arena. 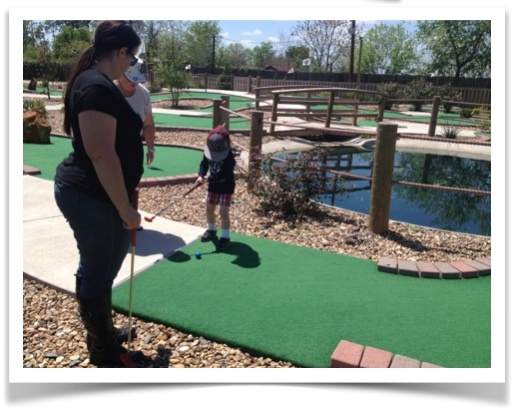 Miniature golf with our eldest daughter and our youngest Grandson. They also enjoyed the Yogi’s water park before we grilled burgers for a late lunch. 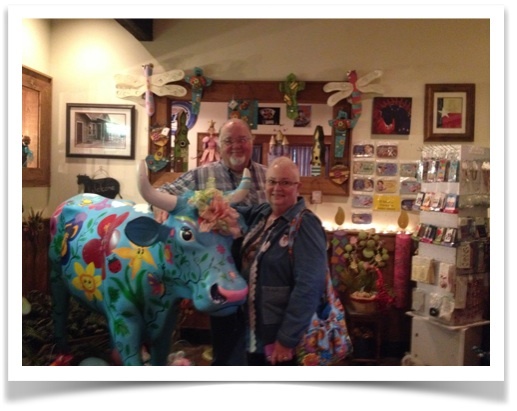 Celebrated Carol’s Birthday at Goodson’s Cafe in Tomball. Great atmosphere and decent food. We had to get a birthday photo with their cow. 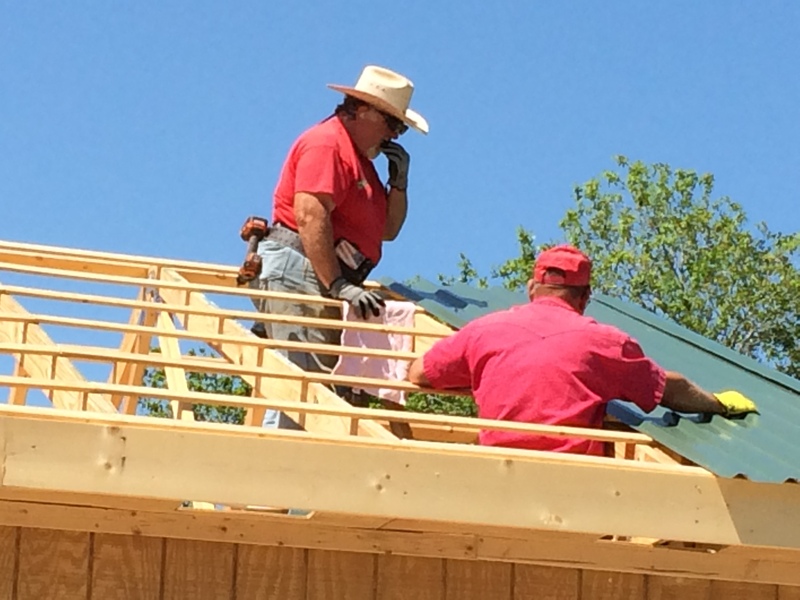 I have been working with Richard, another workamper, we met last summer at Mark Twain Landing in Monroe City, MO. Richard and his wife Debbie, who worked in registration with Carol, left about a week ago. 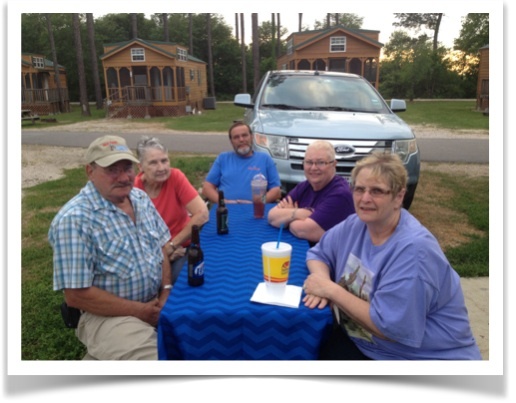 We hosted a farewell cookout for Richard and Debbie. Robbie and his wife Della joined us. Richard is in the back, Debbie is on the right. So that now leaves Robbie and I to finish the construction projects before Memorial Day. 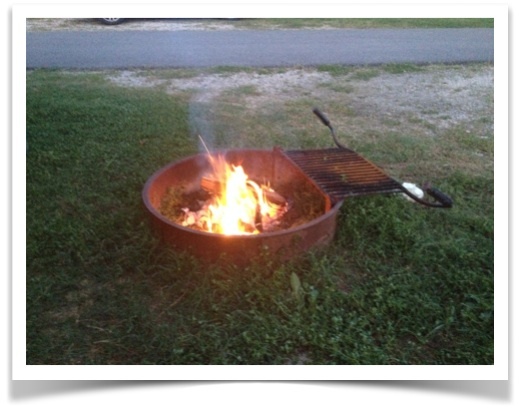 And there is always time for a campfire. That just about does it for a recap of the last two months. We’ve been pretty busy working hard on getting this park ready for the summer crowd. In one more month, school will be out and the park will be in full summer time operations. Thanks for stopping by. Y’all come back now.